Pioneers in the industry, we offer manual type electro magnetic induction capper and continuous type electro magnetic induction capper from India. Manual Type Electro Magnetic Induction Capper is mainly applicable of capping operation of not- metal bottlenecks such as plastics and glass. 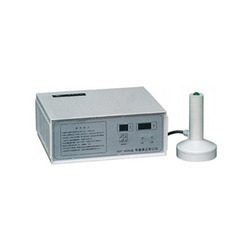 Manual electromagnetic induction capper is suitable especially for those customers who require with a small output. Description:Spis-100 electromagnetic induction capper is mainly applicable to capping operation of non- metal bottleneck (i. E. Plastics, glass) which features of flat threaded cap, but not applicable to capping operation of metal & non-threaded pressing cap, cap with φ20-135diameter and active handle, high cap with over 3 mm spacing between cap surface & bottleneck after screwed in, especially, Manual electromagnetic induction capper is suitable for the customers who Carrying out continuous capping operation for small output. Continuous Type Electro Magnetic Induction Capper is mainly applicable of capping operation of not- metal bottlenecks such as plastics and glass. Continuous Type Electro Magnetic Induction Capper is suitable especially for those customers who require continuous capping operation with large output. 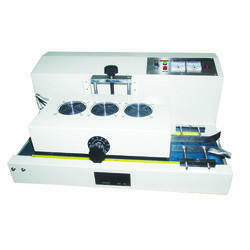 Our Continuous Type Electro Magnetic Induction Capper is highly suitable for capping operation of a high threaded cap. SPIS-200C Table Top Electromagnetic induction capper is major suitable for capping operation of a flat-capped small bottleneck with thread that is made of non-metal materials such as plastic, glass, while it is not suitable for metal & non-threaded bottleneck, or shameful high cap, or bottleneck whose diameter is ranging φ20-135. Especially, Continuous Type Electro Magnetic Induction Capper is suitable for the customers who carrying out continuous capping operation for large output and lot.